In the correct light, you will be able to see the green sheen on this all black Asian Glossy Starling Aplonis panayensis. You will not be able to miss this bird in coastal towns, cultivated areas, even in the edge of primary forests. Local residents will know not to park their cars under power lines where some of these birds roost. Others perch on dead trees, coconut palms or even wayside ornamentals. Check the area under such plants if you are going to leave your car overnight. It was a long journey to see the Pale-bellied Myna Acridotheres cinereus. At the moment the only place in Sabah for this bird is in Tinagat beach near Tawau. Originally from South Sulawesi, this species has established itself here with a population approaching 100 strong. 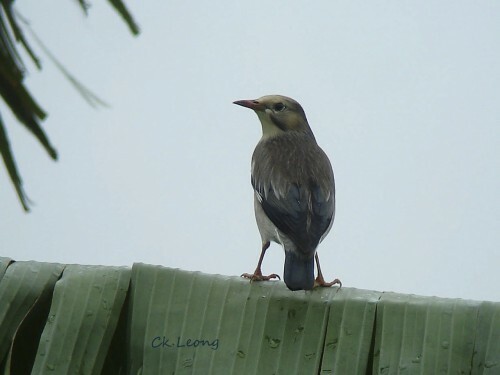 As with other mynas and starlings, they have stayed near humans and cultivation. 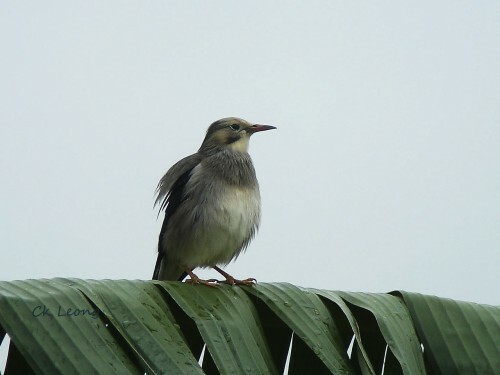 Whether they will follow the road of the Javan Myna remains to be seen, the Javan having established itself along the roads and oil palm estates of the East Coast of Sabah in a few short years after arrival. It got better. 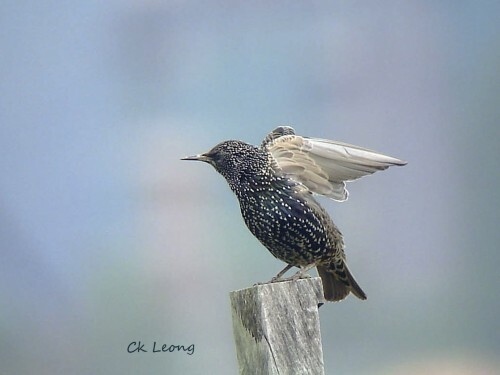 While celebrating our encounter with the European Starling over breakfast, we got news of another starling at the same area in Penampang. The light rain didn’t hamper procedure and the bird was a cracker. A Red-billed Starling Sturnus sericeus. It was feeding on an Okra plot and later flew to a banana plant. Joy for all those with photo gear. 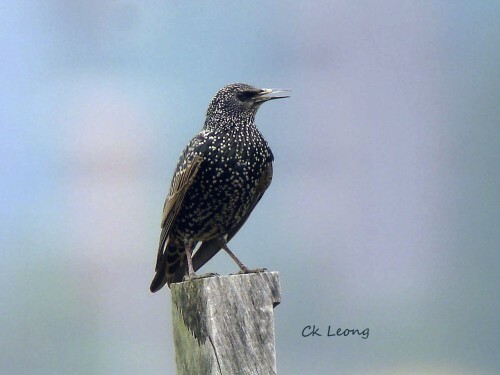 This starling is the first record of the species in Borneo. Thanks to Eugene and the gang. This morning’s outing to the rice paddies of Penampang didn’t go according to plan – it went way over. While scanning for migrant shrikes (there were 2, the Brown and the Long-tailed Shrike), something much larger caught my attention. Wait, it looks like a… yes a European Starling! 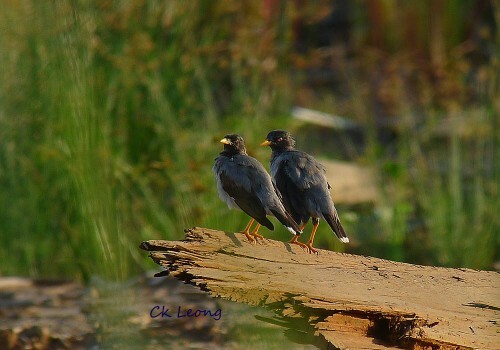 It may be very common in Europe and mainland Asia, even considered as a pest, it may be able to mimic speech or holler Mortimer or whatever else it is capable of. 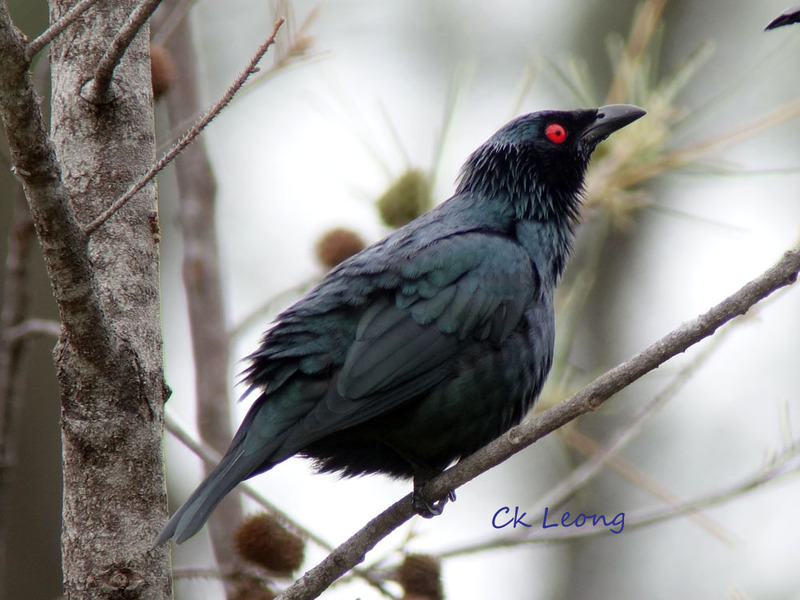 What matters is that there is a lone European Starling in my scope, only the 2nd record for this bird in Borneo. It does not get better than this.